Now, I’m going to tell you a ghost story… This image is all that is left of the hull of a famous 17th Century shipwreck in Australian waters called the Batavia, nearly 400 years old, named after an old Dutch settlement in Jakarta, Indonesia. 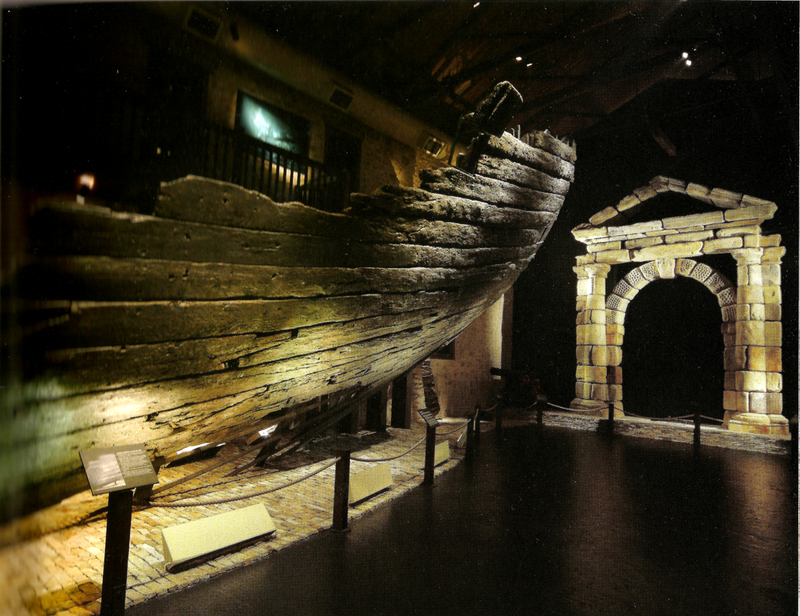 This is part of the hull of the Batavia- all that was left of magnificent ship after nearly 400 years beneath the waves. Batavia was the Titanic of her day, when she was launched in 1628 from Holland. She was the prize flagship of a fleet of seven, on her maiden voyage to Jakarta Indonesia. Batavia was heavily armed with 28 cannon and a company of soldiers to protect her crew of 300 and a valuable cargo of jewels, cloth, wine, cheese and silver for trading. Also aboard were art treasures including a great cameo, Rubens vase and a lost gateway designed to decorate the citadel of Batavia, Indonesia seen here on display. Imagine the Batavia sailing against a midnight sky with flags and banners streaming, the stretching canvas of sails, the creaking of rigging and spars and the glow of lantern and pale moonlight across the sea. No-one would have suspected that an attack would be made from within the ship… so strong and well defended. But The ship had blown off course long ago away from the fleet, the captain lay sick in bed and a mutiny was brewing amongst a band of soldiers plotting their next move. That night, a solitary lookout kept watch high in the rigging, ready to report to the skipper any land in sight. The skipper below didn’t believe what was reported mistaking waves for moonlight on the ink black water before them. Suddenly, just before the dawn of the 4th June 1629, Batavia crashed upon Morning Reef of Houtman’s Abrolhos, the southern-most coral islands in the Indian Ocean off Western Australia. But the story doesn’t end there… they didn’t all go down with the ship. Many drowned, but most of the people made it to the islands of Houtman’s Abrolhos. What started there was Australia’s first recorded European settlement lasting 4 months in duration with tragic consequences. There on the islands the castaways made their camp, peaceably for a month, but trouble was brewing. The islands were not very hospitable for the survivors of a shipwreck. The Dutch castaways found themselves in a desperate situation. The meagre supplies of food and water salvaged from the wreck were rapidly dwindling and it would not rain. When the Batavia’s Commandeur Pelsaert suddenly departed the islands with all the senior members of the VOC in the ship’s longboat, the sinister Under-merchant Jeronimus Cornelisz became the island’s high executioner, earning for the island its gruesome name— Batavia’s Graveyard. Of the 198 castaways, 125 men, women and children were put to death by the sword, bludgeoned, beaten and drowned. Women were brutalised and raped by the mutineers. Inspired by the legendary shipwreck story I began to research and draw…. The story captivated me and inspired me to create a map of the events. While creating the drawings, the image of the shipwreck and ghostly castaways appeared strongly in my mind’s eye. It took at least a year and a half in pure research (2006-2007) and a year to draw the narrative (2009). The embroidery was begun in 2010 and ¾ completed for my Masters shows in 2011. 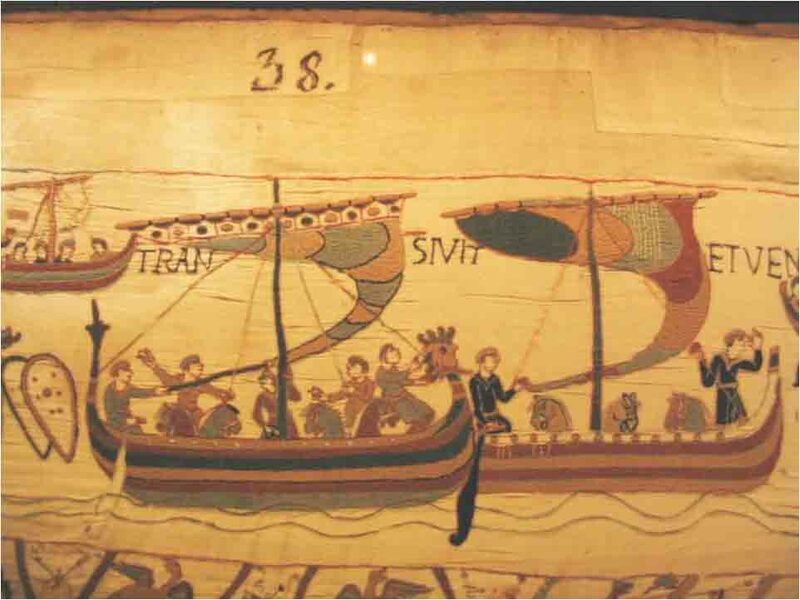 The Bayeux tapestry was a major inspiration artistically… with its bold cartoon style… as well as the famous 17th Century Batavia Shipwreck illustrations. 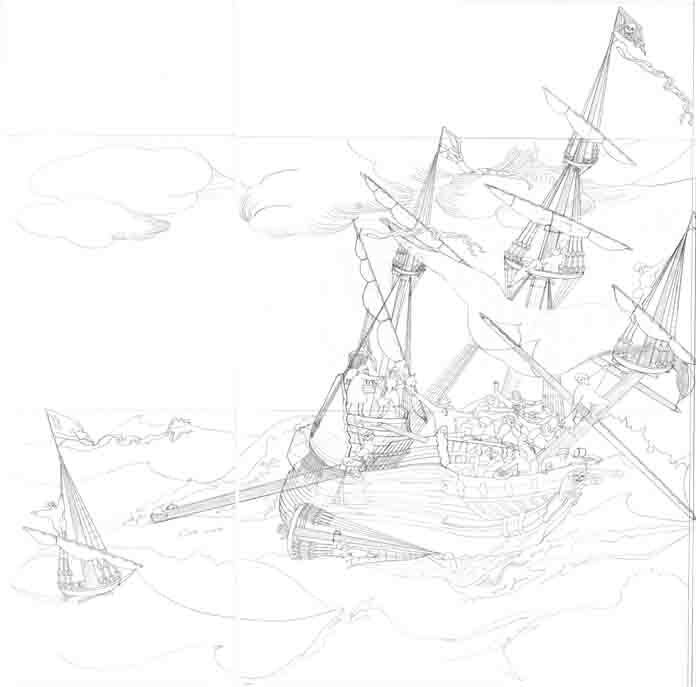 This is my blue-print of my Batavia tapestry, created like a map of the Batavia shipwreck, to be stitched and roped on completion like a 17th century top-gallant sail. 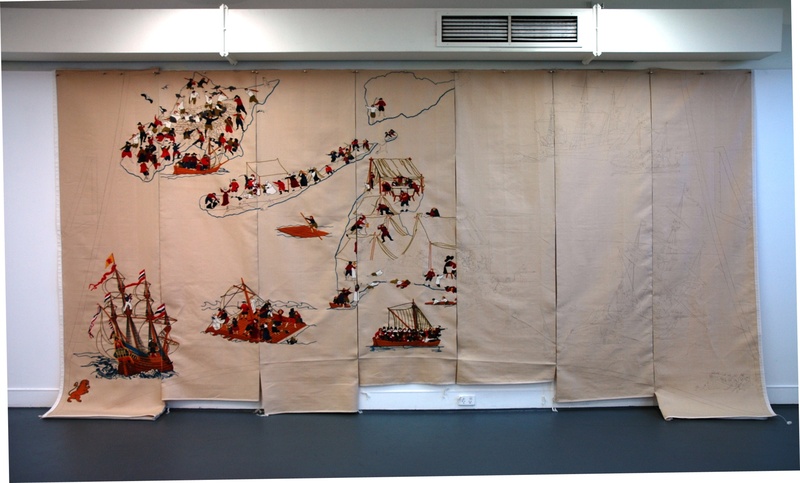 Essentially what I’ve done is create a monumental embroidered map on linen, which tells the story of the shipwreck and aftermath in panels. 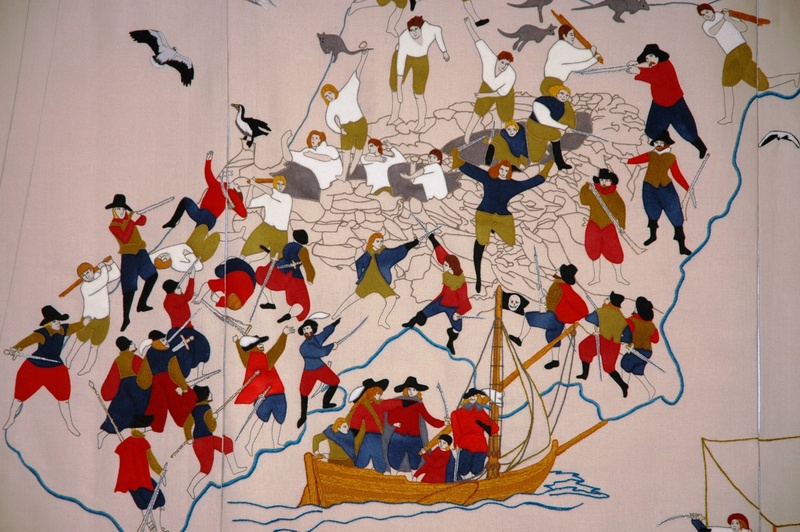 The Batavia Tapestry, work in progress, May 2011. The panels are vertical and full scale measuring approximately 1 metre by 3 metres. There are seven panels in total which together create my vision of the Batavia shipwreck, in the form of a 3 by 5 metre traditional sail. 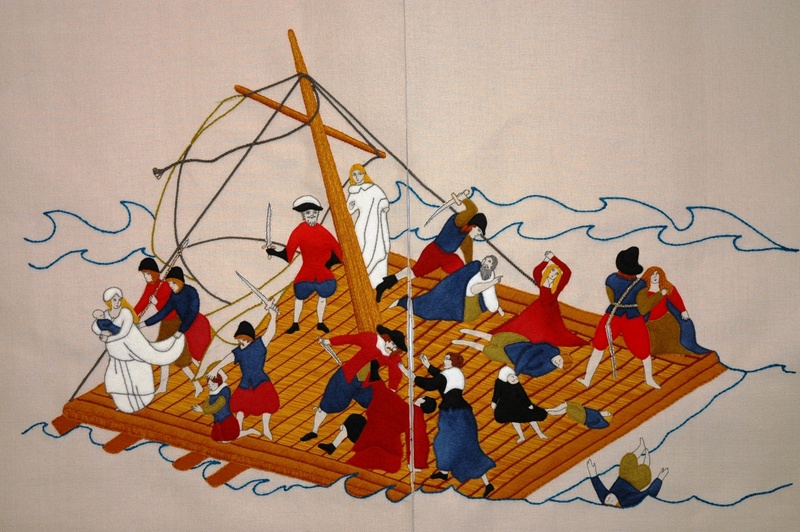 This was the first illustration made for the tapestry, showing the Batavia sailing before the shipwreck. In the creation of the drawing I researched ships of the era and referenced the modern day replica of the Batavia, in the ornament and design on the stern. 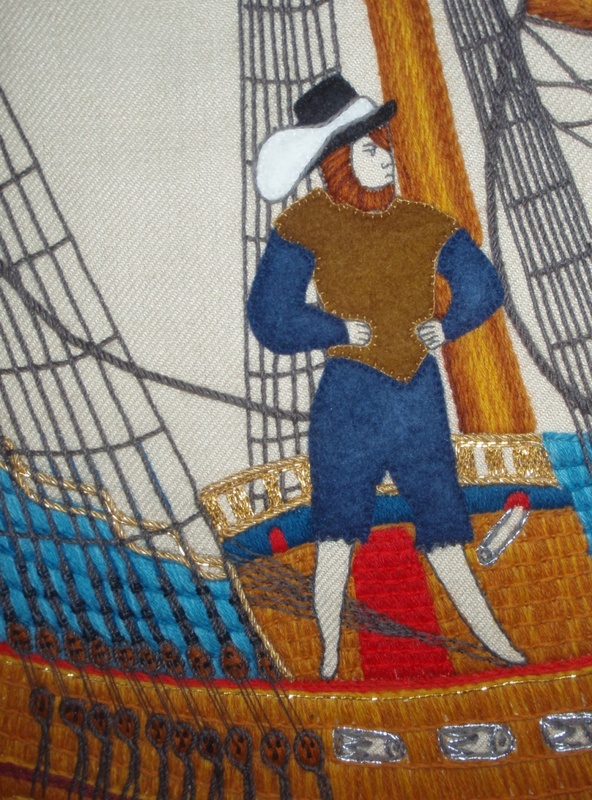 I show a solitary sailor high in the rigging and a proud stern skipper below. Before the shipwreck, the lookout warned the skipper below that there was broken water ahead, but his warning was not taken seriously. Discipline had really broken down aboard the ship, since the Batavia parted from the rest of the fleet. 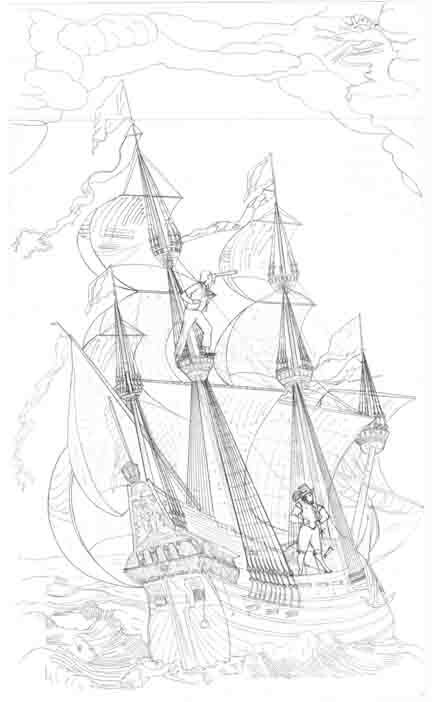 This is my favourite illustration of the shipwreck scene… During the chaos of the shipwreck— the main mast was cut down which is the absolute last resort a crew would make to lighten the ship. However the main mast crashed down across the ship and pinned it further against the submerged reef. Soldiers and sailors began to loot the ship and burst open casks of wine and spirits, preventing the VOC officers’ desperate attempts to ferry their human cargo to the neighbouring Abrolhos islands. Houtman’s Abrolhos is a wild, windswept group of islands off WA where the castaways made their encampment. The main settlement was on Beacon Island and there they stayed until the castaways were able to make boats and rafts to use to travel between the islands. During the shipwreck, they tried to cut the main mast down in hopes that they would be freed but all was lost. It became total anarchy! There’s a young crew member being sick over the side of the ship, while a sailor looks on laughing amidst the chaos. The sick captain Pelsaert is shown running out in his night shirt to confront the skipper, Jacobsz, while a mutinous crew around to them in a panic drank and fought over treasure, before realizing that their fate was sealed. The ship was lost, they were marooned and all the wealth aboard was relatively worthless. With the ship wrecked, the most precious commodities left were the rapidly dwindling supplies of water, bread and cloth. Following the wreck, Commandeur Francisco Pelsaert set sail in search of water in the ship’s longboat. 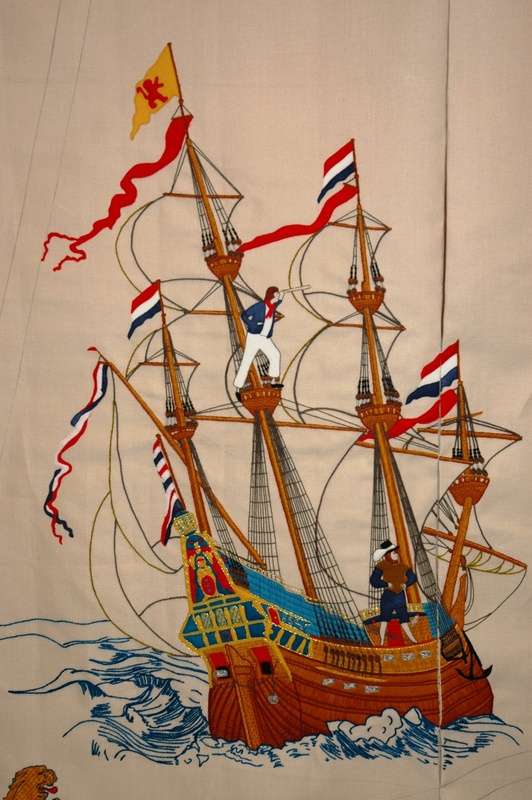 Overloaded with passengers and provisions, Pelsaert set sail for the journey he ultimately made to Indonesia, in order to organise a rescue ship. This image is like my Sergeant Pepper’s Album cover, showing all the important characters aboard. There was actually 48 people aboard including two women and a baby in a boat not much bigger than a Couta boat! Meanwhile a band of pirates, led by Jeronimus Cornelisz, had seized control and begun to massacre the marooned survivors of the shipwreck on the Abrolhos Islands. With the departure of Pelsaert, officers and crew of 48, no castaway held a higher position than Cornelisz. There on the islands, he alone represented ‘the Company’ and exploited the position, calling himself Captain-General. Any disobedience was considered mutiny, including stealing food, water or wine and was brutally dealt with. This young man represent the youth and blind ambition of the pirates plotting to take over the islands come hell or high water. “We shall be the Devil’s Own” was the oath of loyalty signed by Cornelisz and his followers and they were. For four months Cornelisz held the power of life and death over the castaways. The former ‘supercargo,’ Cornelisz, resplendent in a redcoat and lace, sentenced over 125 men, women and children to their death. Only 73 of the original crew survived Cornelisz’ ‘reign of terror’. 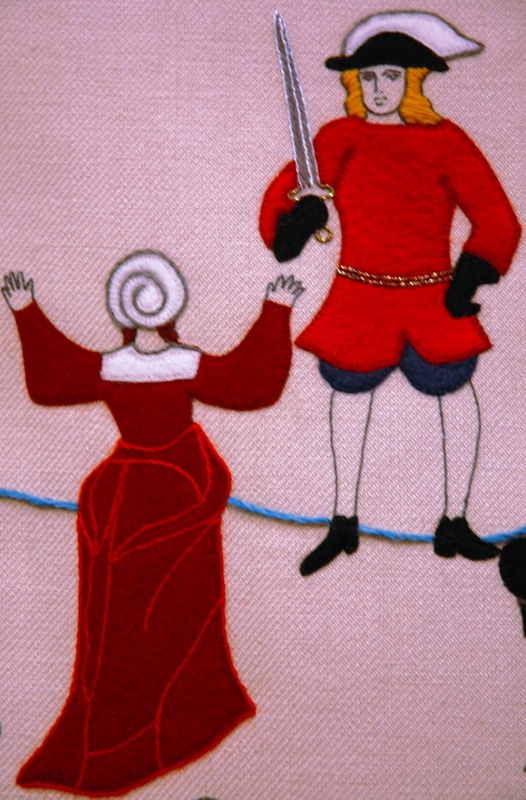 This image shows the first open killing of Andries de Vries, a young officer who was forced to kill the sick and then executed for speaking to the pirate king’s favourite, Lucretia. 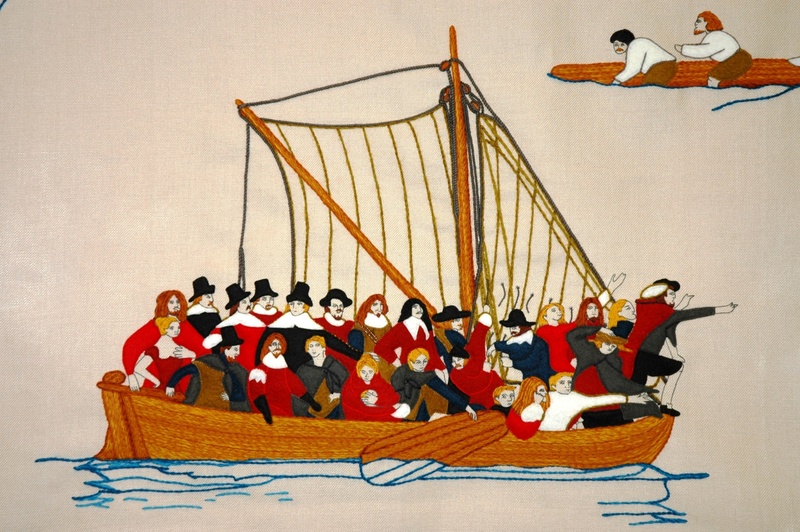 This image shows a large raft inspired by the Raft of the Medusa, showing how the mutineers did away with passengers secretly at sea. This is seal island, where many of the older women and children were taken and killed. The sick were the first to go, and then women and children were separated and slain by the mutineers. Meanwhile, on the High Island, a group of loyal soldiers camped. Their leader Weibbe Hayes organised a band of loyal soldiers to stand and fight the mutineers. The soldiers had been deliberately marooned there by the mutineers, as they might have prevented their rising to power. The cunning Cornelisz had the soldiers depart from the wreck site of Batavia’s Graveyard (Beacon Island) on the pretence of having them search for water. In reality he hoped they would not find water and die. But these men were tough; many would have been veterans from the 100 years war in Europe and seasoned to fighting and killing. The soldiers were without shelter, tents or blankets throughout the winter, apart from two ‘huts’ built from coral slabs that appear like world war 1 trenches with men leaping from them. These coral huts are in fact the oldest structures known to have been built by Europeans on the Australian continent, and can still be seen today on West Wallabi Island. When the mutineers of Batavia’s graveyard saw the smoke signals made by the loyal soldiers, when they found supplies of water, Cornelisz and his men knew they had to take the island by force or by bribery. But Weibbe Hayes and his loyal men refused to take the bait. The defenders stood their ground and in an epic battle made their stand against the mutineers and were successful in capturing their leader, Cornelisz. 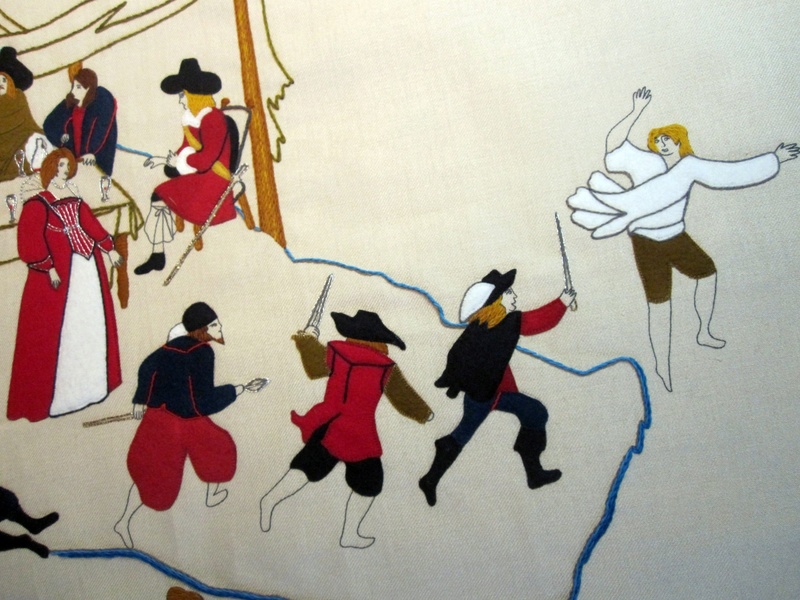 Every recorded person by name is depicted in the tapestry and some figures like Pelsaert, the skipper Jacobsz and the pirate king Cornelisz’ henchmen are shown several times, in their acts of violence and murder. 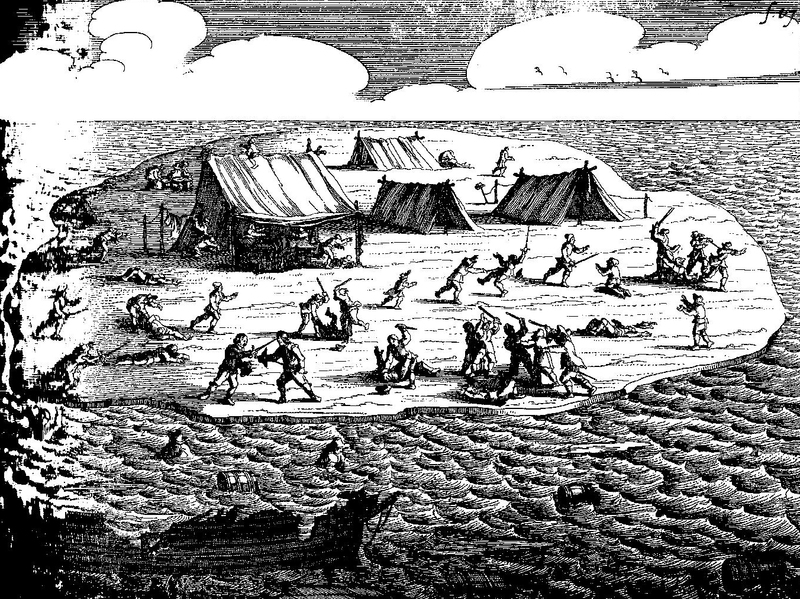 This image shows a secret killing on East Wallabi island, which was not inhabited by the castaways, but mentioned in the captain’s journal of the events. 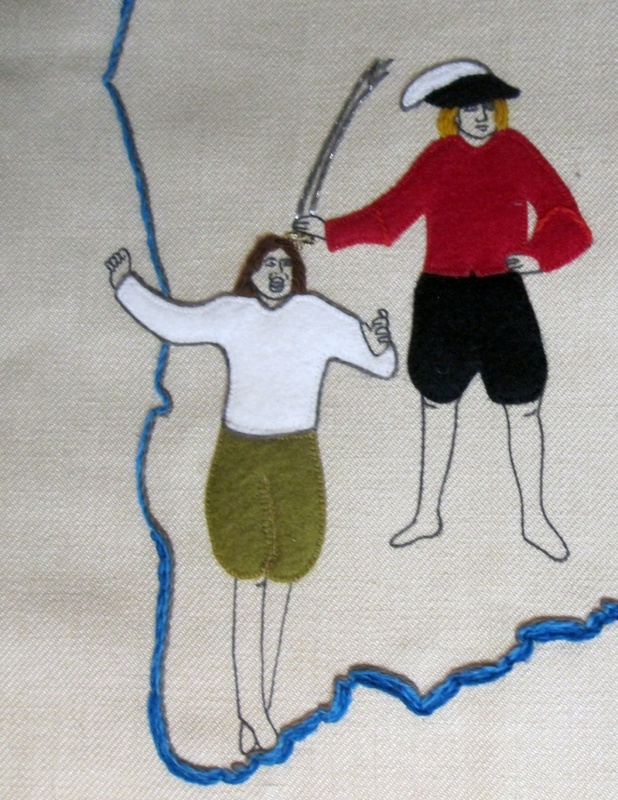 … But Wiebbe Hayes, the leader of the good soldiers fought desperately to warn the Sardam, and made it just in time to warn the captain of the mutiny. When the mutineers reached the ship, they were cast in irons and subsequently they were hung for murder. 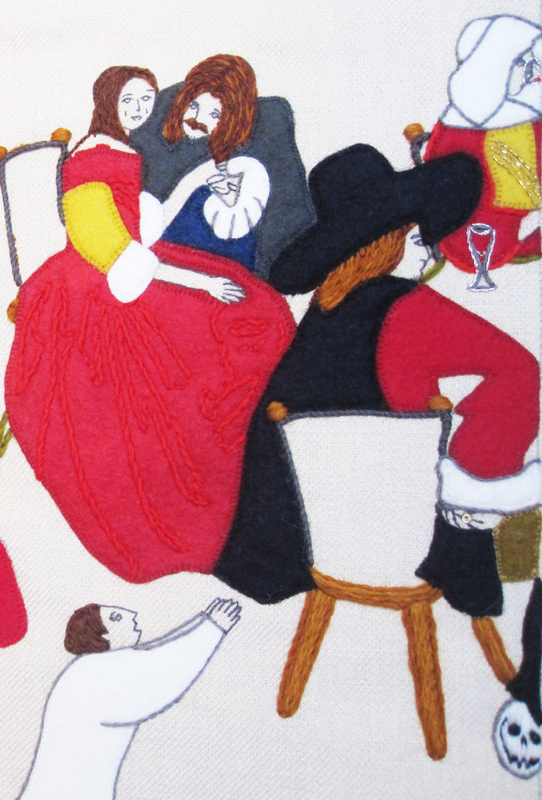 The tapestry project is my passion and intended as a gift for future generations to enjoy. I also wish to publish a book, narrating the legendary Batavia shipwreck next year. My aim is to raise awareness of an extraordinary episode from the beginning of our history. 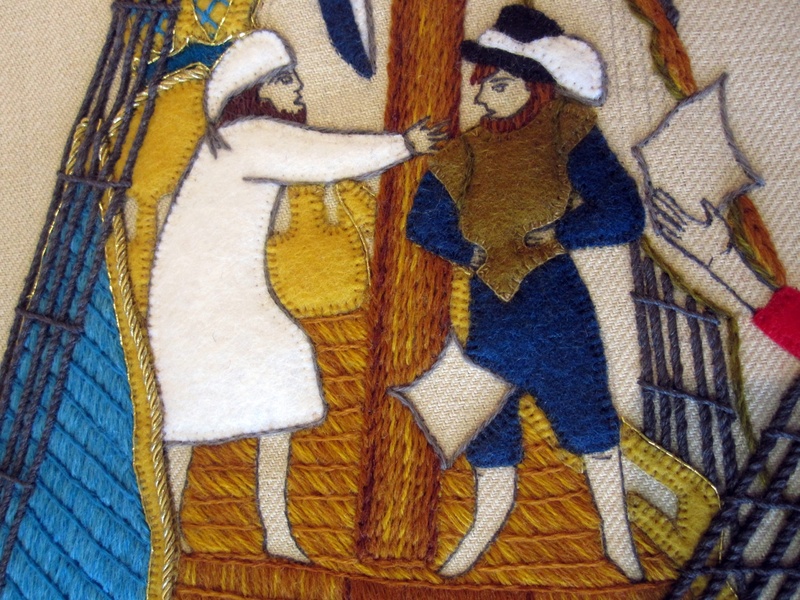 I feel I have been able to connect with the past, through the process of making the tapestry. It has expanded my knowledge, research, skills and understanding. I have learnt how to splice, serve and knot rope, how to spin and weave fabric, embroider and make lace. I feel engaged with history through creating and researching this project, as if I had seen and walked the decks of the Batavia myself, many years ago. 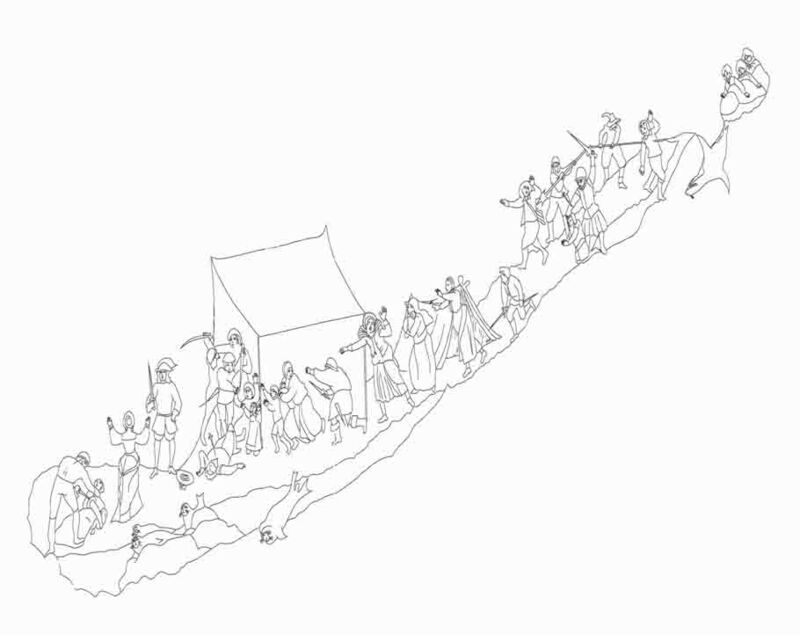 I would describe the project as Australia’s contemporary Bayeux Tapestry. 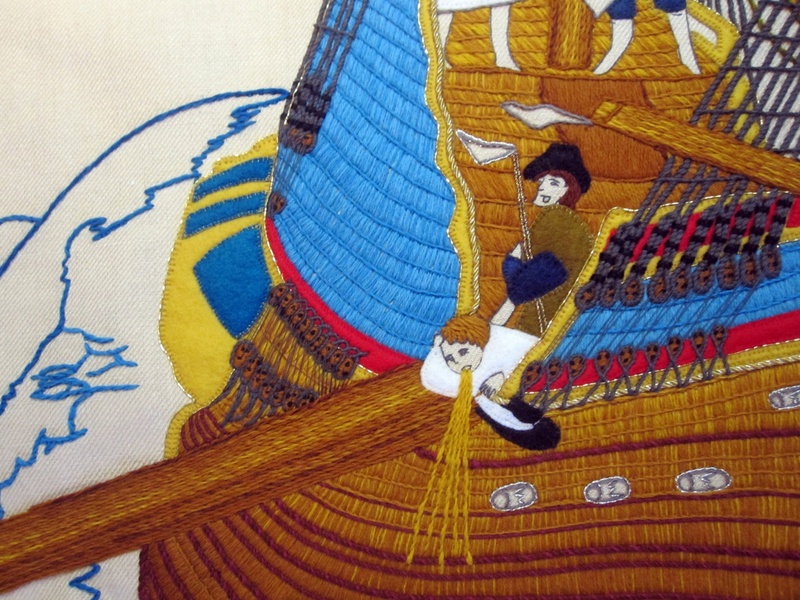 The embroidery is historically accurate, based on hours of archaeological research and historical journals, its visually engaging and near completion. I am seeking to launch the project shortly and would love to invite your comments on how best to achieve my goal of launching the project and getting it on permanent public display. Hi Melinda. Thank you for your work. Can anyone use your pictures of your work? I am writing a screen story for the Batavia but I wanted to get as many pictures as possible to give a visual feel as to what was happening. However, if you are not comfortable with then not to worry. Please keep my project confidential. Pingback: The Unfortunate Voyage of the Batavia – Episode 9: Dividends | Stuff What You Tell Me!